Premila Rumtel works primarily in India with refugee women. Many of them are below the poverty line and cannot support themselves or their families. Many reside in refugee camps. Premila trains them in basic sewing skills so they can sell their products and survive. Of course in the process of this they are discipled and many of them come to faith in Jesus. From time to time Premila goes into the countries neighbouring India to visit people there. Bright Hope World personnel first met Premila while she was studying at SAIACS in Bangalore. The principal of the day identified Premila as a person of high integrity and vision so on her return to the border area of India we stayed in touch with her. In 2004 we received an application from her to commence the training programme and became involved with her at that stage. Refugee women primarily, their children and families as well. Premila is a woman of high integrity and energy. She has a huge vision and compassion for the people she is working with and a clear strategy to implement. 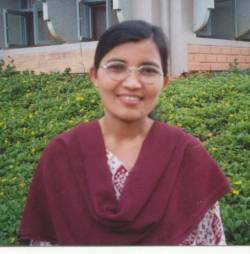 Premila Rumtel is a graduate of SAIACS with a strong desire to reach the unsaved in the Himalayan regions. This is consistent with our commitment to the greater region. The main other people are Martha Rumtel, the sister of Premila. She worked for several years at DTS and now because of her similar vision she is actively working in this ministry. Chankha, Ester, Pastor Kishan and others work in the ministry. They also have a small committee. Primela controls the financial matters. The vision for the project is to uplift the social, economic and spiritual life of women in the region. To make women self-reliant in all aspects of their lives. To make women effective in their skills. To generate income in their respective families and finally to upgrade the financial condition of the church. This is mainly done by teaching them to sew and cook and to assist them to sell their products. Ester is a refugee who was in the vicinity and likely to be ruined or to die within one month. She was rejected by her parents, relatives, church and her boy-friend to whom she was supposed to get married. Physically she became very sick. God used DCM in a simple manner. DCM bought a small frame which has a statement of encouragement and a small card with welcoming words to join in DCM. Prayerfully she was sent a card. She said that it moved her inner being and she received hope in her life to live again. She felt that at least there was somebody to love her and show concern for her. It comforted, impacted, challenged her life and touched her inner pain. Indeed God tremendously changed her life. As a result she joined in the training. She used to work very hard to get a small amount for their daily needs. Today she says that she has learned a lot about how to make things, how to weave the cloth, how to sell things and earn a good amount of income. She says she is happy and can stand on her own two feet. She wants to help other sisters who are in need of love, care and guidance. In 2009 all the refugees in Premila's area were relocated to the United States so her work with these women was unable to continue. Premila has now changed the focus of her ministry to children and has opened a hostel and school for 24 children - see IND03a.